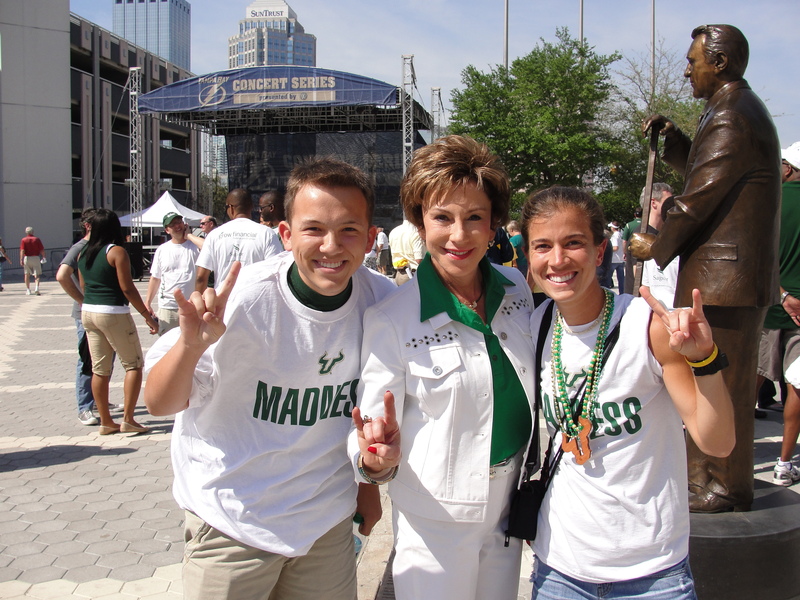 This weekend brought us to Tampa to go to the USF Men’s Basketball Game against West Virginia. After USF lost at the end, we decided to venture 30 minutes to the northwest to the small town of Trinity, FL. Mommy has had in her mind for quite some time now that we would be trying a restaurant known as Zim Zari. Yesterday was that day. The day we went to the Zim. Zim Zari is a ‘California Coastal Grill’ specializing in California style fare. 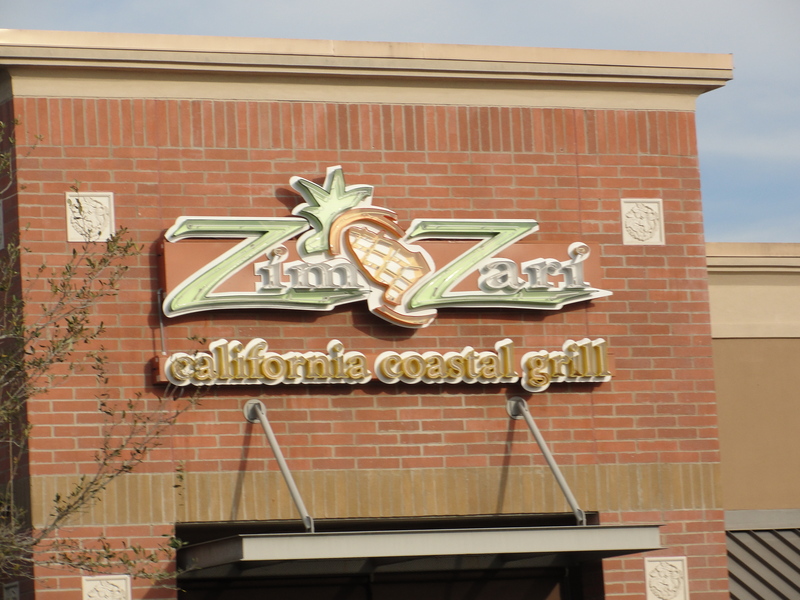 There are only 2 locations of Zim Zari and, shocker, neither is in California. Mommy had originally heard about it via Facebook. I was somewhat worried when I was unable to review Zim Zari from any of the food blogs I subscribe to. Either way, we were going and that was that. We arrived at Zim Zari around 3:00pm and found it to be pretty empty. We opted to sit outside and were brought right over to our table. 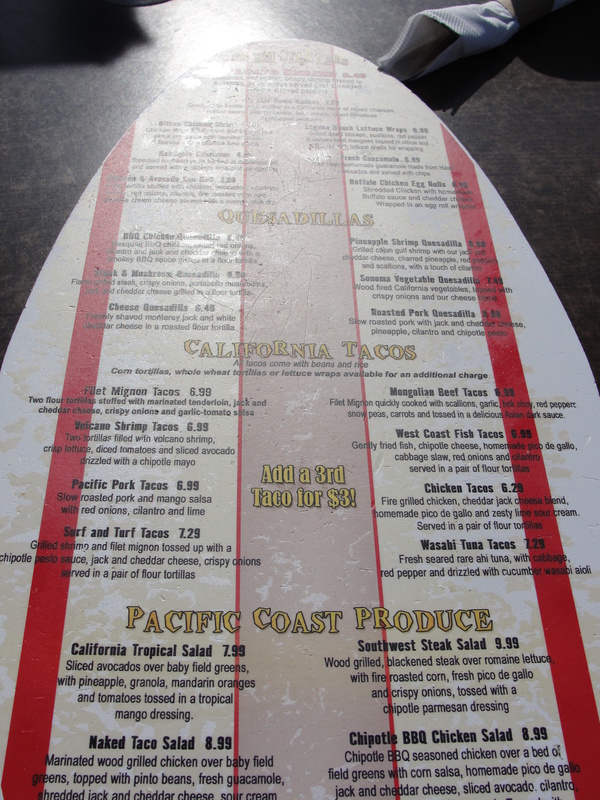 The menu is on a surfboard shaped thick foam board. We were immediately brought over a basket of chips and salsa. As none of us had lunch yet (we did have a snack at game…review to come), we all dug right into the chips. 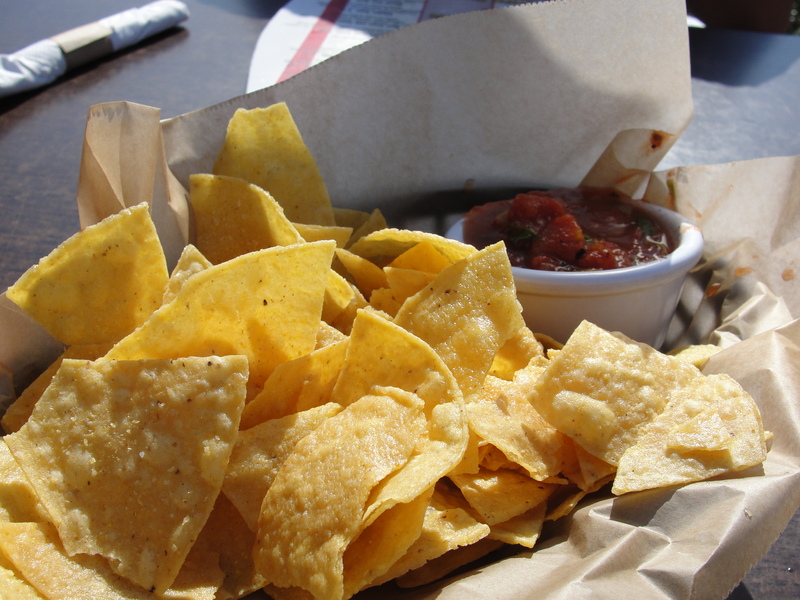 The chips were your basic tortilla chips and were served hot. I really enjoy these chips and found them to have a great crunch & taste. The chips were seasoned with thick pieces of salt which added a little extra something. I only had a few bites of the salsa and it was okay. It was a fruity salsa and a bit on the runny side. We all decided to go with the tacos. 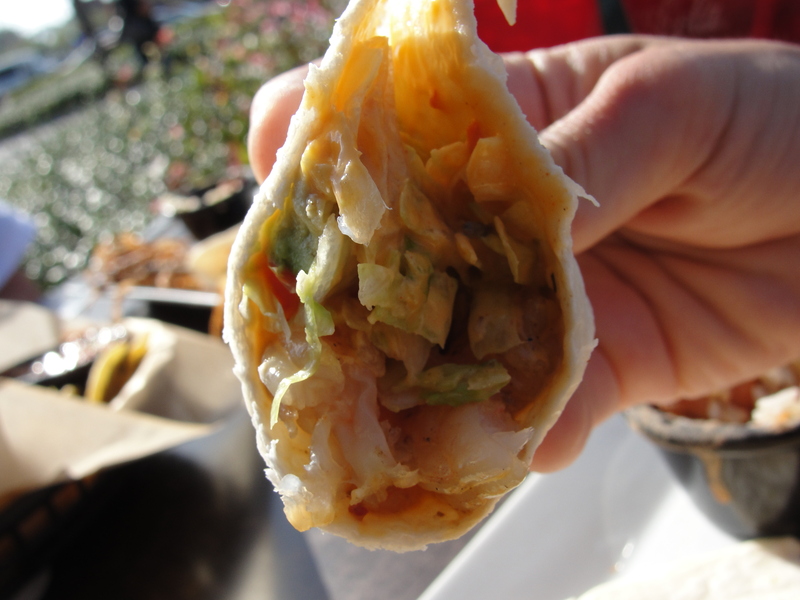 Zim Zari offers 8 options of California Tacos. A taco meal comes with 2 tacos and rice & beans. Plus, you have the option of adding a third taco (of any kind) for only $3. I was absolutely shocked to see that the only fish tacos they offered included fried fish. They most certainly should have had grilled fish tacos – this really bummed me out. I decided to go with 2 Shrimp Tacos and 1 Chicken Taco. Mommy got the Surf-n-Turf Tacos (filet and shrimp) and Taylor got the Chicken Tacos. Our food arrived rather quickly and the tacos looked great. What didn’t look great was the extremely small size portion of rice and beans. Let us begin with them. The rice was white rice and was way overcooked. This resulted in very hard, dry, bland rice. I did not like the fact that they shoved the rice and beans in one small sized serving cup. This made mixing the two quite difficult to do. While the rice was really bad, the beans were great. 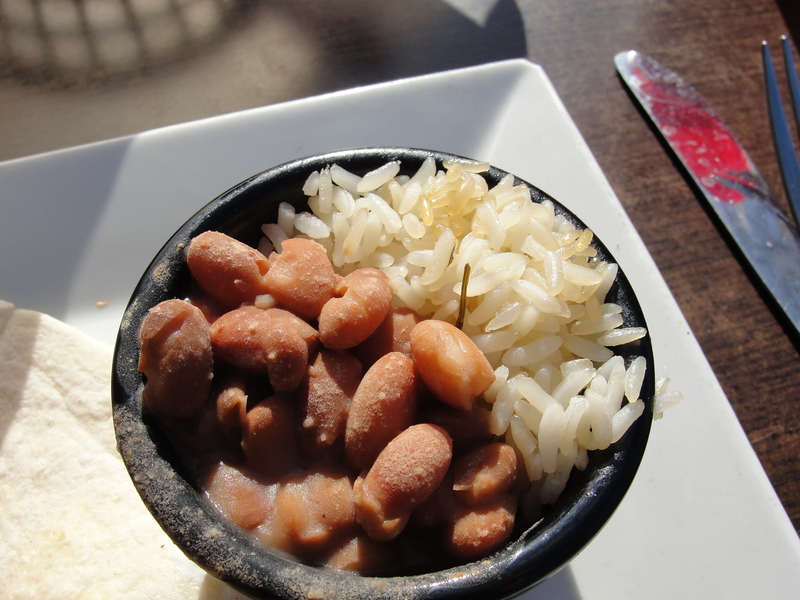 They were pinto beans – seasoned and cooked to perfection. Each bean was so tender and had a smoky flavor to them. The only way I was able to eat the rice, was to mix the beans in with it. If the rice had been good, these would have been fantastic. I decided to start with the Shrimp Tacos. 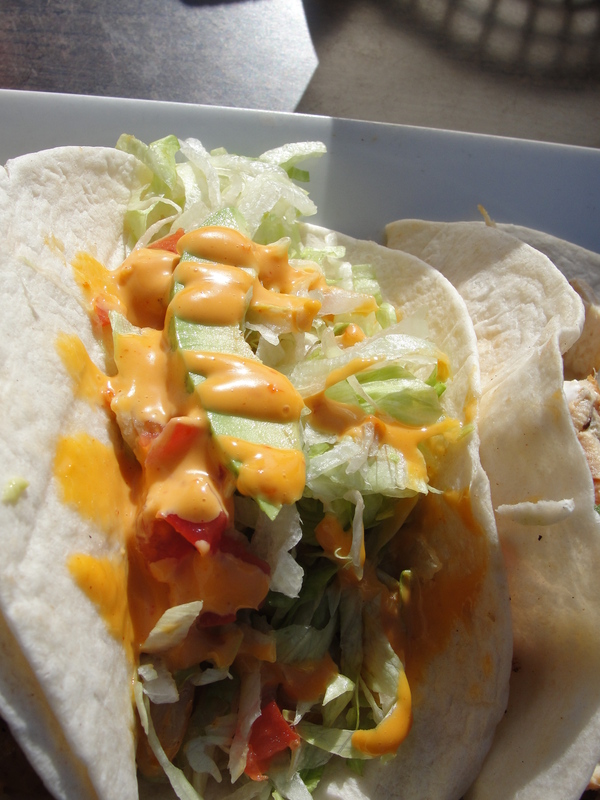 The shrimp tacos included volcano shrimp (grilled shrimp in a creamy, spicy sauce), lettuce, tomatoes, sliced avocado and a drizzle of chipotle mayo. Even though I am not a big fan of spicy, there wasn’t another option of shrimp tacos available. I picked up the first taco and found it to be pretty heavy. From looks alone, it looked as if it would be great. The lettuce was crisp & plentiful and the avocado slice was huge. I took my first bite and found the shrimp to be a bit spicy but not overbearing at all. The shrimp was okay in flavor but not that great. They were fully cooked but, did not have a grill taste to them at all. The consistency reminded me of frozen shrimp which I’m sure these were. While the shrimp were very small, there was a good amount of them. The toppings on this taco were fabulous. The lettuce was indeed crisp and fresh as were the tomatoes. The avocado slice was so perfectly ripe and added a smooth texture to the taco. I did not taste any chipotle mayo at all. All of this was wrapped up in a flour tortilla. The tortilla itself was okay but nothing to write home about. It was certainly not authentic or home made. I ate both of my shrimp tacos and found the toppings to be the winning part over the shrimp themselves. Also, the shrimp were very salty/sodium-y. I did not like this part at all. While eating the tacos, I had to continually drink a lot of water and I had dry mouth the rest of the day. I probably would have no reason to get the shrimp tacos again. The use of fresh, nicely grilled shrimp, along with a tasty tortilla, would have made these tacos just perfect. After finishing my two shrimp tacos, I moved onto my Chicken Taco. 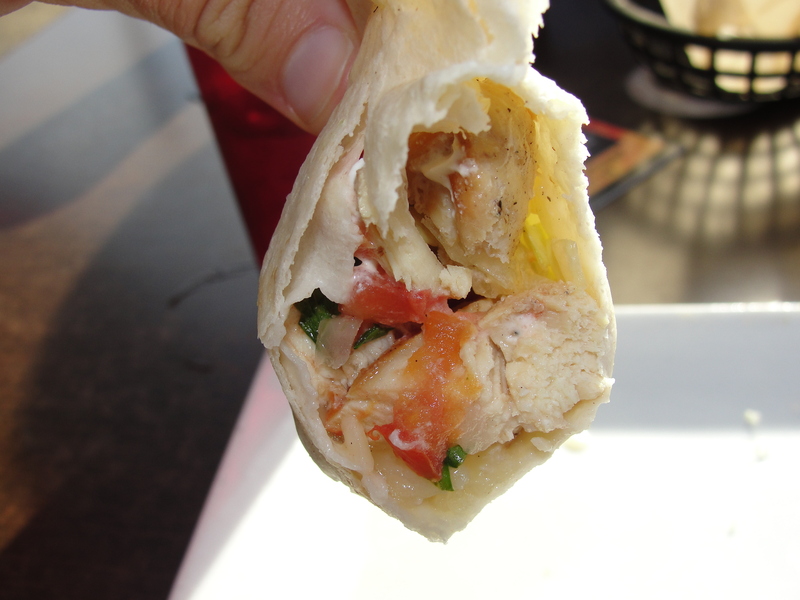 The chicken taco, served in a flour tortilla with, cheddar jack cheese, homemade pico de gallo & zesty lime sour cream. Unless I am losing it, I don’t recall their being any pico de gallo at all – which is really a bummer because it is just what the taco needed. The chicken was grilled and the pieces were too big and flavorless. You had to do a lot of chewing to get through the dry, flavorless chicken. If the chicken had a nice grill flavor, or a baja chipotle flavor to it (and was chopped smaller), it would have been great. The cheddar jack cheese was melted into the tortilla/chicken itself and I really couldn’t taste it at all. As I said, I don’t recall their being any pico. The zesty lime sour cream tasted just like regular sour cream to me and gave the chicken a bit of wetness. None of these flavors really went together and I found this taco to be pretty disappointing. Had this taco had smaller, flavored chicken along with pico and lettuce, it would have been much, much better. Again the tortilla was okay, but nothing too great. While eating the tacos, we continued to munch on chips. Overall, the chips and beans were my favorite part of the meal. I think both the shrimp and the chicken taco had (and have) the potential of being really, really good. When you think California tacos, you think really fresh, wholesome ingredients. The fact that I tasted so much salt in the meal, leads me to believe the main parts of Zim Zari were not fresh. 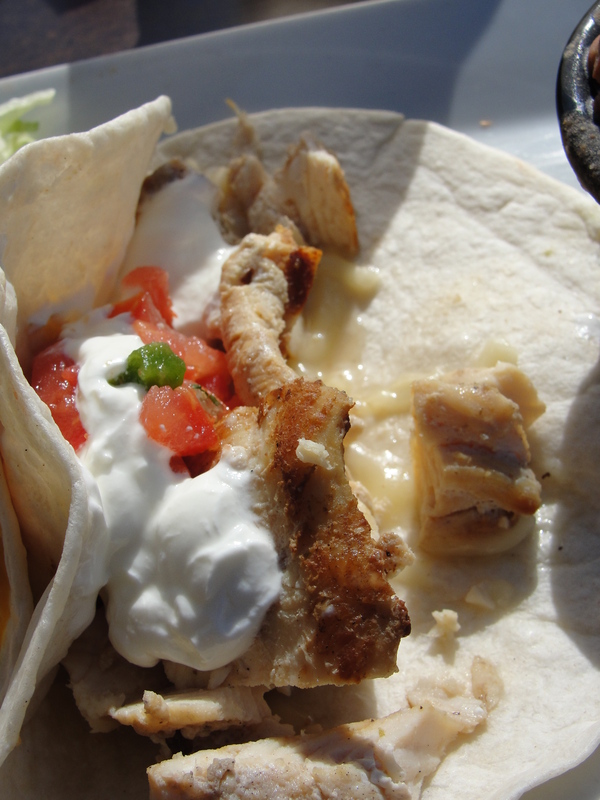 Plus, I really don’t like the fact that they do not offer grilled fish tacos! 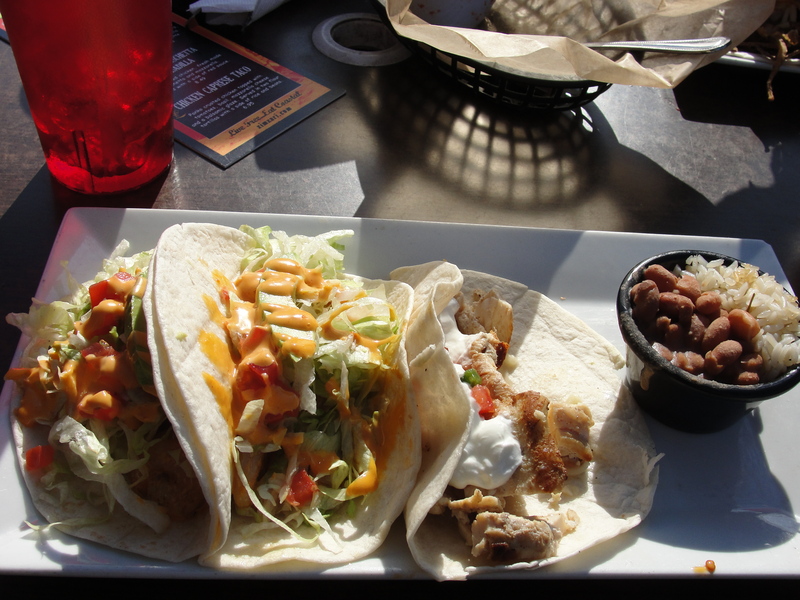 Mommy and Taylor both loved their tacos – stating they were some of the best they have ever had. They both wish to return and Mommy even went as far as to say she would eat there every week if we have one closer to us. I really was hoping for great things from Zim Zari. At the end of the day, I would go back and try Zim Zari again. Our waitress was one of the best we have ever had and the prices weren’t too outrageous. Cheap, no, but, reasonable indeed. The total for the 3 of us, each having 3 tacos with rice & beans, and 2 iced teas, was $34. Even though I didn’t love my tacos, I ate them all and left Zim Zari feeling pretty full. If I ever return, I will try out different offerings or, see if I can customize my tacos a bit more. As we were leaving, the restaurant was beginning to fill up and I’m sure this is a place where the locals really enjoy. For me, it was just okay. Zim Zari was not the highlight of my day in my old stomping grounds of Tampa/USF. No, that belongs to our photo op/meeting of Judy (see below). But, I am glad that we got to go To the Zim.